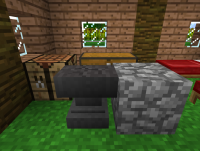 An anvil has te same hight as a normal (solid) block. Yet when you stand on top of an anvil you clearly stand a small distance lower then when you would stand on top of a normal block. This is very noticeable when you walk back and forth over a normal block and an anvil.